Setting up a simple Christmas themed activity can be so easy if you go with something like our Christmas water sensory play activity! 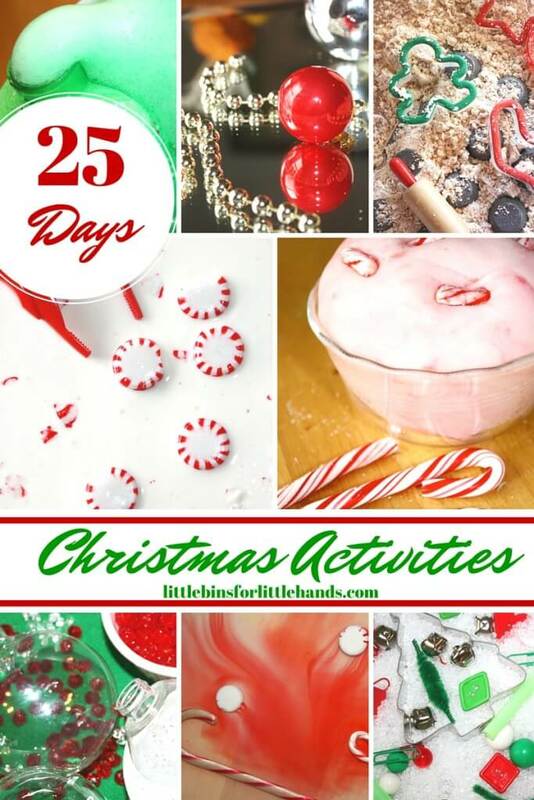 Spice up your 25 Days of Christmas Countdown with a novel sensory bin that will have your kids playing happily for hours. Add plastic ornaments for active hands to dump, pour, and fill along with a baster for awesome fine motor skills. Simple sensory play for a Christmas win! 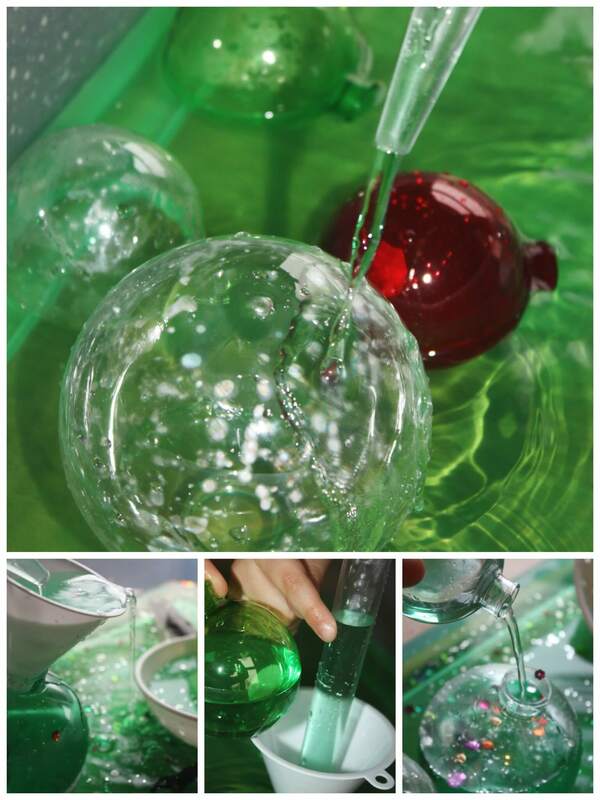 Our Christmas water sensory play with a simple sensory bin is simple fun! We love all sorts of water sensory play activities for exploring, playing, and learning! 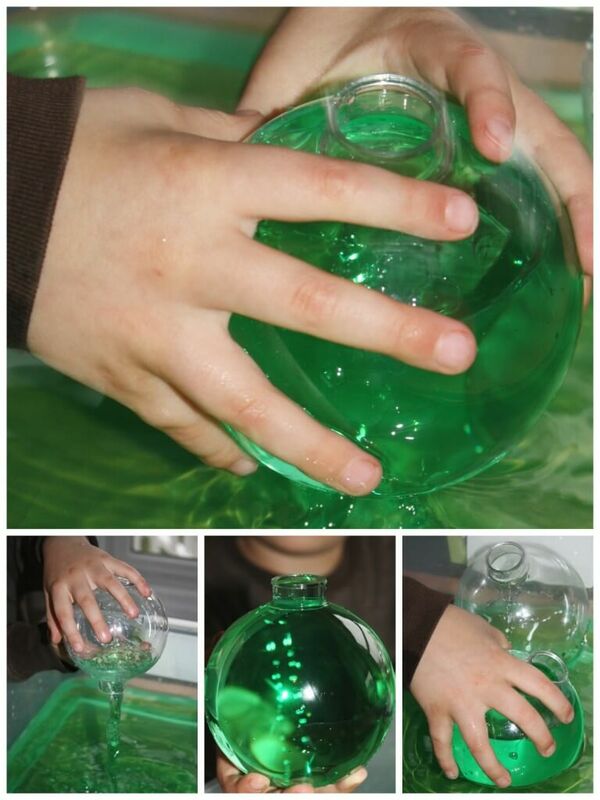 Water is a favorite sensory bin filler around here because it is so versatile! We are all about exploring Christmas sensory play activities this time of year and have done so many already! 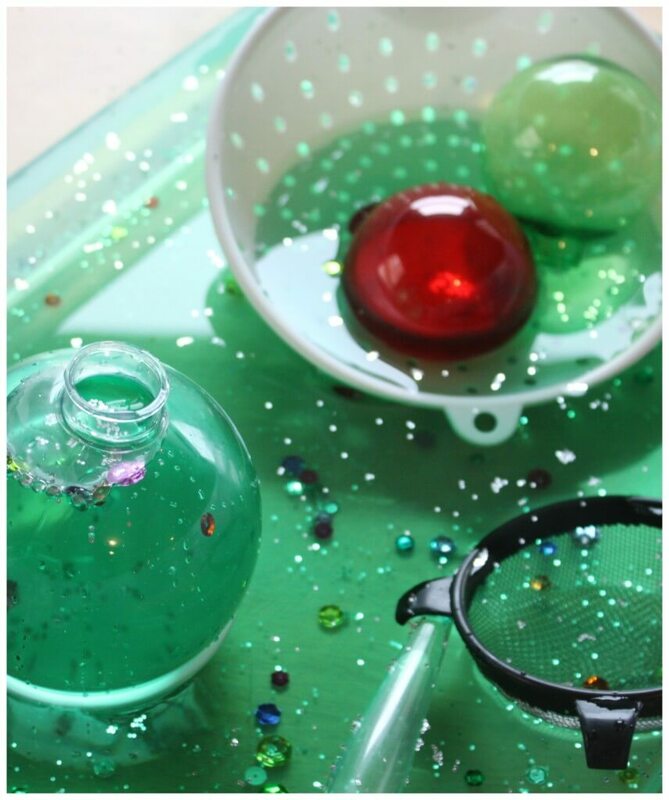 We have used these perfect plastic globe ornaments is a few ways already! We made erupting ornaments with baking soda and vinegar, a craft sand sensory bin with ornaments, and even actual tree ornaments. We just tried color mixing too! This Christmas sensory play water bin was easy to set up for quick morning play! 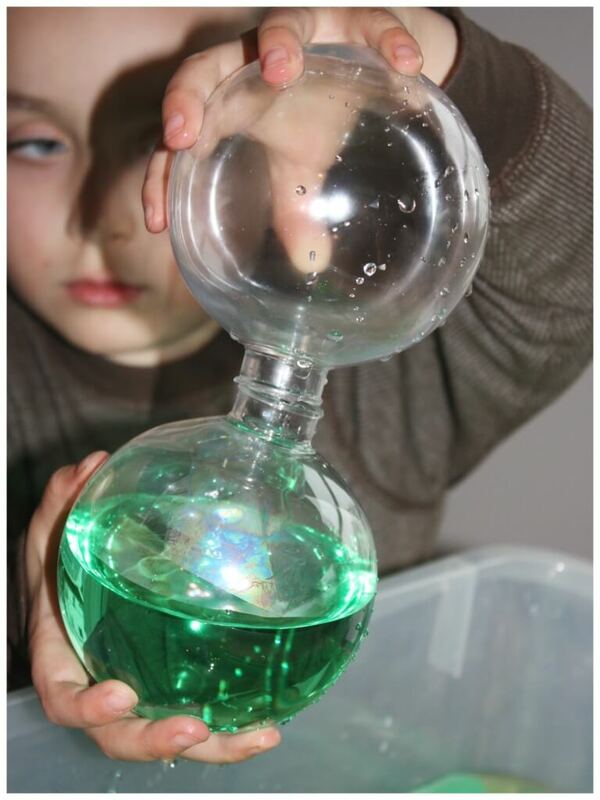 Add water to sensory bin and then add food coloring to desired color. Helpful Hint: Make the water temperature enjoyable like bath water for longer play! Add glitter and sequins if desired and then add ornaments! Set out with sensory play tools and your Christmas sensory play water bin is ready to go! He picked out what he wanted to do immediately with this Christmas sensory water bin! Dumping and filling the large ornaments into each other. Great hand eye coordination and visual sensory play as well as tactile sensory play. Adding in a baster, strainer and funnel makes great fine motor play too. Simple water sensory play is always fun any time of the year! Use this idea all year long and change the colored water for the season! The possibilities are endless. 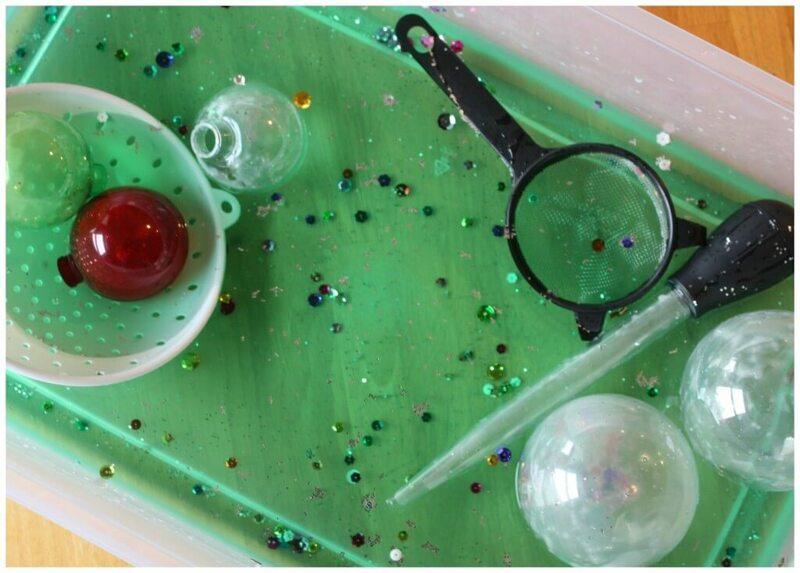 My son loves a simple sensory play idea like this whenever we have free time. The fun continues filling the ornaments using a funnel and baster! We made a waterfall and tried to sink the ornaments! He also used the baster to race them around the sensory bin. Good thing I chose the large bin for this! 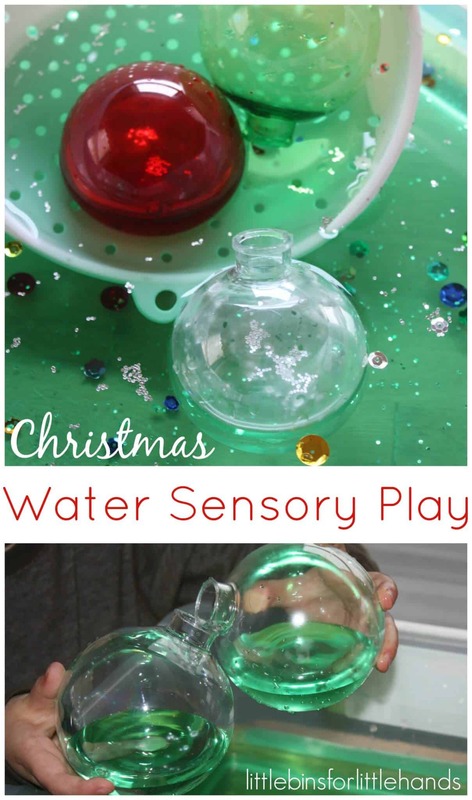 Excellent Christmas water sensory play with nothing more then water, a little food coloring, and some plastic ornaments to encourage creative play and learning! A perfect way to keep the kids busy on an indoor day anytime of the year! 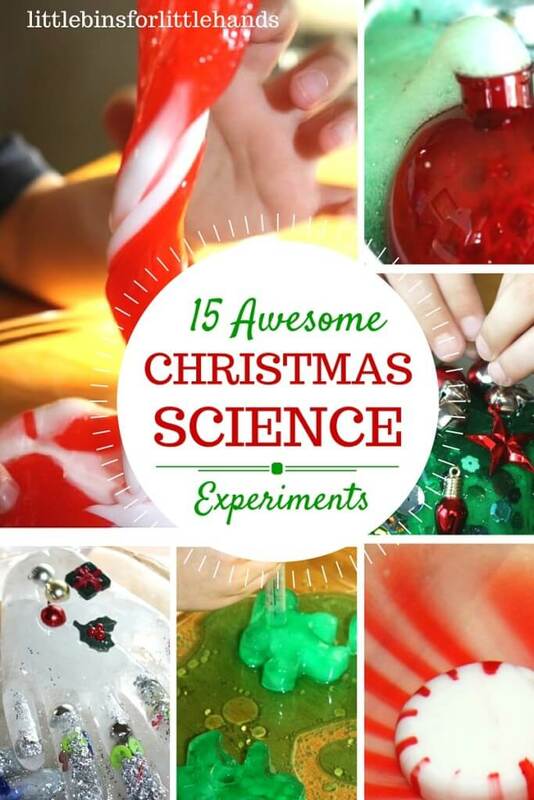 Click on the photos below for more awesome Christmas science and sensory play ideas. Where did you purchase the plastic balls for this activity? I have been unable to find clear plastic balls with a large opening. I purchased them at AC Moore or Michaels Craft stores. I just removed the metal hanger pieces. Hope you can find some!